(CHICAGO) January 29, 2019 –– Today the NAMA Foundation debuted its new research e-guide on pantry services – Leveraging Pantry Services to Retain Talent. With unemployment at an all-time low, many employers are looking at new ways to recruit and retain talent. One of the ways companies are expanding their benefits is through an employer-sponsored program call Pantry Services. 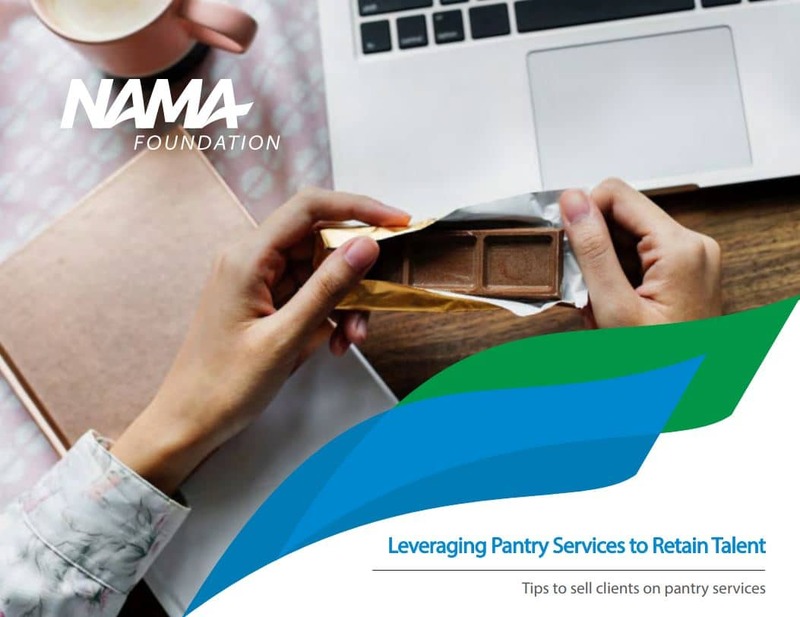 Funded by the NAMA Foundation, this e-guide will walk you through the ways you can sell clients on pantry services, highlighting challenges to consider and providing tips on maintaining your very own pantry. Featuring key information from leading pantry experts, this is the perfect tool to help you start expanding your business lines. “Your future is our focus at the NAMA Foundation, and we strive to provide the industry with customized research to help you stay on top of the latest trends for business growth,” said Terri Bruce, Director of the NAMA Foundation. You can purchase a copy of Leveraging Pantry Services to Retain Talent in the NAMA Store under “Reports/Research,” here. Rates are $39 for members, $79 for non-members. Founded in 1936, NAMA is the association representing the $25 billion U.S. convenience services industry. With more than 1,000 member companies – including many of the world’s most recognized brands – NAMA provides advocacy, education and research for its membership. Visit NAMA at www.namanow.org, and on Facebook, Twitter and LinkedIn.